While many denominations claim to be growing, the largest group in American religious life is the disillusioned--people who have been involved in the church yet see few similarities between the church's life and the person of Jesus. In the midst of elaborate programming, professional worship teams, and political crusades, they ask, "Is this really what Jesus called us to do? "While the church has dismissed these people as uncommitted and lacking in faith, perhaps the opposite is true. Their commitment to authentic spirituality over institutional idolatry might be the very corrective the church needs. These people respect Jesus, but question what Christianity has become.In If the Church Were Christian, Quaker pastor and author Philip Gulley explores how the church has lost its way. 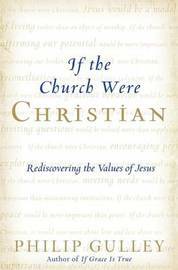 This eye-opening examination of the values of Jesus reveals the extent to which the church has drifted from the teachings of the man who inspired its creation. Many Christians might be surprised to discover how little Jesus had to say about the church, and that he might never have intended to start a new religion.But the church is here to stay, and Gulley is determined to help the church find its soul. If the church were Christian, Gulley argues, affirming our potential would be more important than condemning our brokenness. If the church were Christian, inviting questions would be valued more than supplying answers. If the church were Christian, meeting needs would be more important than maintaining institutions. These simple statements return us to the heart of what Jesus cared about during his ministry. Gulley provides a profound picture of what the church would look like if it refocused on the real priorities of Jesus.